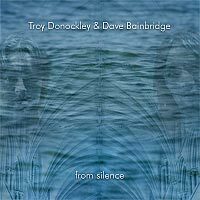 Troy Donockley & Dave Bainbridge. From Silence. Live at Lincoln Cathedral. A Binaural Recording. 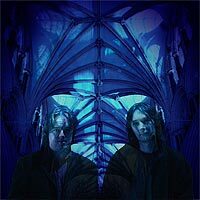 "When Rob Ayling of Voiceprint called us with the idea of playing in Lincoln Cathedral we were both immediately enthusiastic about the sonic possibilities of performing in such a huge, reverberant space. And not just any space - but one contained in this most beautiful and ancient of buildings. With no music pre-prepared, just an idea of which instruments we might play, we decided from the outset to seek our inspiration from our surroundings and the cathedral's acoustics, so that the music would, in some way become part of the building, and aspire, for the seventy minutes or so that we played without a break, to something beyond ourselves. With the tragic death, only a week before the recording, of Dave Williams, Troy's dear friend and pipemaker, the occasion took on an added poigniancy and we therefore dedicate this recording to him. We are both thrilled with this binaural disk, which we present to you (apart from a few cuts due to a technical fault) exactly as it happened, with no repairs or overdubs." 3. From Silence: Part Three (15.51) (Donockley/Bainbridge) - features in part the traditional tune "Anach Chuan"
This disk has been recorded with a special technique known as binaural stereo which gives optimal performance when played back through headphones. Binaural stereo will reveal full surround sound and is designed for headphone listening. The technique involves sampling normal human hearing and rendering that information into two channels of stereo. Dallas Simpson uses a special custom designed in-ear microphone technique and creates the spatial choreography (movement of sound in three dimensional space) live in real time during the performance. By carefully co-ordinating his own movements within the performance area, using a multi-speaker array and capturing both live and amplified sounds, an organic continuous three-dimensional surround mix is created. Bernard Overton, maker and inventor of the finest Low Whistles known to humanity. Rob Ayling from Voiceprint for suggesting this recording and making it all happen. Serenity comes in many forms and I readily admit to owning several therapeutic recordings as I like to chill out whilst going to gigs in the car. Certainly they help me maintain a haphazard kind of stability, that is essential in our line of business. I mean, you can only take so much of ‘Whisky In The Jar’ and by helping me to relax prior to a gig is all-important for my soul. If truth were known, it’s the kind of music that I’d like to perform myself but wouldn’t know where to begin. So I give you ladies and gentlemen the chance to treat yourselves to a bit of ‘folk’ music therapy in the more than capable hands of Troy Donockley (Uilleann Pipes, Whistles and Acoustic Guitar) and Dave Bainbridge (Keyboards, Electric Guitar and Bouzouki). Some of you out there reading this review may well be aghast at what appears to be the indulgence of a musician’s whim turning his own thoughts into exhilarating experiences for others (myself included). By pushing the boundaries whilst still retaining the integrity of what is essentially an audio palate, the audience are treated in much the same way an artist would see his painting evolve on a canvas. The setting of Lincoln Cathedral must have proved an inspiration for both Troy and Dave because the music washes over the listener like a gently rippling stream and much like those therapeutic recordings I was talking of earlier it is not hard to imagine yourself emerging from the other end of this album fully refreshed. Now I know that many of you like to categorise your folk music so for those of you of a sensitive disposition I’d place it alongside Enya or Clannad in the ethereal Celtic collection as a reference point and I’d suggest you light some candles, submerge yourself in a bath of Radox and be prepared to be thoroughly chilled-out. Found this page via a search engine? Click here.